So you want to stay with locals and you’ve heard that Airbnb was a thing or you’ve used Airbnb in other countries and loved it? No matter the reason, you have decided to use the popular peer-to-peer accommodation platform for your trip to New Zealand. Good on you! To make you life even easier, we have compiled a few notes how to make the most of Airbnb in New Zealand. After all, we have had “stay with locals” platforms here for decades, from the WWOOFing, HelpX and Couchsurfing and the simply kind people inviting you in for a few days. New Zealand was made for Airbnb! So here is the Kiwi take on Airbnb along with a few tips on how to use the platform during your gap year in New Zealand. By the way, did you see our 20 Awesome Airbnb Rooms in New Zealand for Under $30? The first step in using Airbnb during your gap year in New Zealand is to join the platform. Here is how to join Airbnb. Then you will need to fill up your profile. Make sure to do that well: give some details and add a picture. This helps build trust. Finally, be verified: for last-minute bookings or if you have been randomly selected, you will need to send a copy of your ID to be verified. It is a good thing, it adds trust between your host and you. The main thing to understand about Airbnb is that it caters to every need, from a business guy looking for a room when everywhere else is fully booked to a couple of backpackers looking to stay with locals and discover all the secrets of an area. For this very reason, it is critical to narrow your search to exactly what you are looking for. First up, use that price slider. Couples will benefit from the price rather than a single person, considering that most rooms only charge an extra small fee to add an extra person. Placing your slider at the NZ$50 mark for a couple will usually guarantee you a stay around the NZ$30 per person which is pretty competitive. Read more about this in the “How Much Does an Airbnb Room Cost in New Zealand?” section below. You will also want to select your area quite tightly as some towns have little to no public transport available. If you do have a car, make sure to select a host that offers parking, especially in big cities like Auckland where an overnight paring can be up to NZ$20! For more advice, see 10 Tips to Make the Most of Airbnb in New Zealand. Individuals with a spare room or listing their holiday house. Because Airbnb only allows members to list one type of room per account, for example, twin room, double room, ensuite room, bunk room, etc, it is common to find the same business behind several listings. Other businesses will mention the different types of rooms available under each picture or even in their descriptions. For example, when you open a listing for one room, the pictures may reveal several types of rooms available. In this case, you would pay the extra for a different room by cash when you meet your host in person. Keep an eye out for that so you know what are your options with each host. It all becomes very clear when reading the reviews what type of host they are, whether it’s an individual or a business. Nevertheless, we have found many hostels that have much better reviews than individual hosts, so consider all your options. Extra tip: make sure to read the responses to each review as well – they are often a great way to see what kind of hosts you will have. To learn more about the locals in New Zealand, see our New Zealand Culture category. 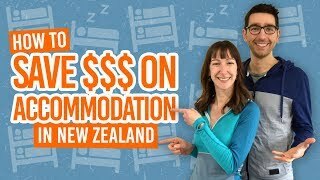 How much does an Airbnb room cost in New Zealand? Since we are mainly focused on backpacking in New Zealand, i.e. travelling on a budget, we will only focus on the lower part of that price slider. You can generally find a room for one person under the NZ$40 mark and for two people under the NZ$60. 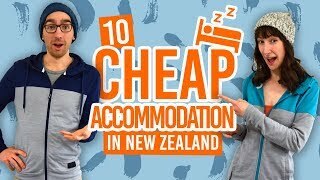 We have found that the prices in Auckland Central, Wellington City and Queenstown Central tend to be about NZ$10 to NZ$20 dearer, simply due to demand and high price of rent. You can often get a discount by staying longer. In that case, contact your host before booking the room, they may just ask you to book one night and to arrange the rest of your stay with them directly. Another thing to keep in mind is seasonality. In summer, prices go up in the coastal towns and in winter prices go up in the ski resorts. Unlike WWOOFing, it is pretty rare to have food included when booking an Airbnb. Most Airbnb hosts will let you use their kitchen to cook your own meal but this is by no means a requirement. Every Airbnb listing is complete with a list of inclusions like parking, towels, laundry, etc. Some come at an extra costs. When looking at a price, make sure to add the”services fee” charged by Airbnb, the “cleaning fee”, WiFi and “security deposit” (refundable) as well, as it can quickly impact a budget. Inclusions are really the section of a listing that you need to pay the most attention to as it often tells you if you are getting a good deal or not by “staying local” versus staying in a hostel. To help you save a few dollars on each of your Airbnb stays, we have compiled this short list of tips. Make sure to switch your currency and location to New Zealand, this can save you hundreds over time! Check all inclusions for every host as “add-ons” adds up! When looking at prices, add the extra fees too. Find more tips like this and much more on our 10 Tips to Make the Most of Airbnb in New Zealand article. New Zealand is one of the friendliest country on earth so it not surprising that there are lots of different ways to stay with locals and truly experience the real New Zealand culture. Get off the beaten track and away from the tourist traps by trying any or all of these 5 Ways to Stay with Locals in New Zealand. This will make your trip all the more meaningful even if you only do it once in a while.